When the austere, reserved Drue, the Duke of Warminster, is asked by a servant at a Scottish posting inn if he will give a lift to a little old lady whose carriage has broken down, he reluctantly agrees. But then he is outraged to discover that the frail old lady is a young red-haired beauty called Jabina, who has run away from home and a marriage forced on her by her father. When their own carriage overturns, severely injuring the Duke, the pair are taken in by aristocratic friends of Jabina’s father and Jabina, terrified of being sent home, tells their hosts that she and Drue are married. The Duke is then appalled to find that through an obscure Scottish law he is now actually and legally married to this unruly and impulsive young girl. 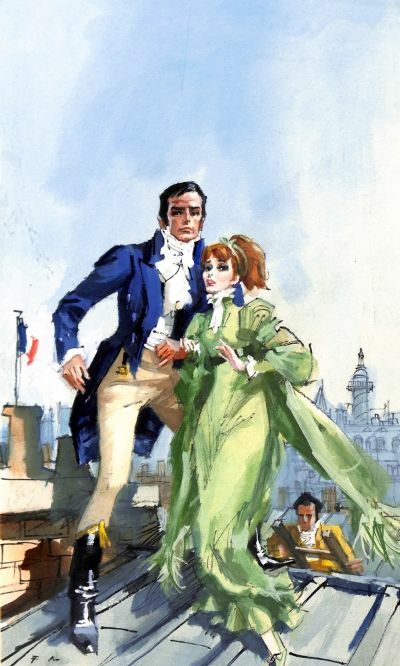 But, as they travel together to France and fall into mortal danger as Napoleon Bonaparte declares war on England, their mutual dislike blossoms into a burgeoning passion the question now is whether they will ever to able to escape from France and return to England to fulfil their unspoken love.